LIVE! FROM GROVER! : The Grover Beach Sizzlin’ Summer Concert Series and Farmers Market runs every Sunday throughout the summer. Enjoy wonderful music along with the opportunity to purchase fresh fruits and vegetables, plants, crafts, jewelry, and unique food items. Vendors, specifically crafters and artists, are also encouraged to be a part of this wonderful community event that grows bigger each year. Those interested in being a vendor at the Farmers’ Market should contact Julie Andrews-Scott at HYPERLINK "mailto:scottsbythesea@yahoo.com" scottsbythesea@yahoo.com. Concerts—June 28: Unfinished Business. July 5: Tres Gatos. July 12: Funk 30. July 19: Dave Crimmen Band. July 26: Free Sound. Aug. 2: Martin Paris Band. Aug. 9: The Usual Suspects. Aug. 16: Impromptu. Aug. 23: Soulamente. Sept. 6: Adam Crowe. Sept. 13: Cadillac Angels. Sept. 20: Up in the Air. Sept. 27: The JD Project. Music and the Farmers Market happen from 3-6 p.m. at the Ramona Garden Park, located at 993 Ramona Ave. Beer, wine, and various vendors also available. The Stone Soup Music Faire and Dune Run Run takes place Aug. 29-30 and is a chamber event (Info: 489-9091). Donations are welcomed. Info: 473-4580 or grover.org. New Times Who are you, Nora? Nora O’Donnell I am the recreation coordinator for Grover Beach Parks and Recreation—an event coordinator for the city of Grover Beach. I coordinate and create special events and make sure they happen. New Times What are you excited about that’s happening this summer? O’Donnell The Concert Series and the Farmers Market, of course. They are the big events happening this summer. New Times Why should residents attend these events? How are they different from other local concert series? O’Donnell Grover Beach has a combined event, the concert and Farmers Market happening at the same time, at 3pm on Sunday afternoons. Last year was the first year for the Farmers and the concerts had been going on for five years. We wanted to have a weekly Farmers Market as well, like SLO does. It fell right in with the concert series. Attendance is better when a concert is going on, so we decided this year to have a concert every week, instead of every other week. 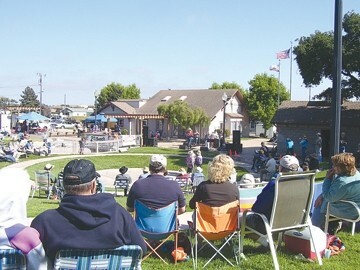 It gives the community a concert to go to every week in Grover Beach. New Times Tell me about some of the live performances. O’Donnell Most of them are local—local talent. We had a committee that chose the bands from submissions in January, based on a 1-10 scale and scoring system. There is a lot of variety of music, from soul to blues, to rock’n’roll. A lot of standard covers that many will recognize. There is such a talented pool of musicians in this county. New Times And what about the market? What can I find there? O’Donnell We have your traditional Farmers Market with sellers of produce and fruits and such, and then we have restaurant-type foods where people can buy the readymade food and we also have crafters. They make anything from placemats, aprons, to jewelry, and notebook covers. There is a big variety of items available. New Times What do you like to buy at the Grover Farmers Market? O’Donnell I’m a strawberry girl. I like my strawberries. New Times The Stone Soup Music Faire and Dune Run Run take place Aug. 29-30. O’Donnell Yes, it’s an event put on by the Chamber of Commerce and will feature many great bands. There will be things for kids to do, vendors, artisans, food, beer, and wine. It’s a nice festival that takes place in a blocked-off area on Ramona Avenue between 8th and 10th streets in Grover Beach, as well as 9th Street from Grand Avenue up to Brighton, so it’s a nice cross–T section that is blocked off for the Stone Soup. O’Donnell I am a firm believer in recreation. Everyone should have the opportunity to have recreation in their communities, especially in tough economic times. Getting together with other people, having a place to relax, and forgetting about the stresses of the day is important. Everyone needs this. Christy Heron remembers when Grover Beach was Grover City. Reminisce at cheron@newtimesslo.com.